Dots NB was created in response to a 2008 report entitled Connecting the Dots: A report on the condition of youth-at-risk and youth with very complex needs in New Brunswick published by then Provincial Child and Youth Advocate Bernard Richard. The report speaks of a need to improve access and availability of mental health services for youth in the province, and of promoting a better community and social understanding of issues related to youth mental health. In an attempt to push this topic to the forefront of our social consciousness, Maureen Bilerman initiated a grassroots movements called Dots NB: Promoting Kids’ Mental Health through Family Empowerment. Drawing from personal experiences at home, Bilerman enlisted the support needed to organize a number of awareness projects. Once such project, the Dots for Youth campaign, brought together over 1200 people to hold hands and form a human chain leading from the Victoria Health Center to the provincial Legislative Assembly in Fredericton. 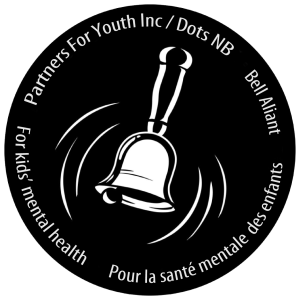 Another, the Ring-a-Bell campaign, is a collaborative project that introduces topics related to mental health in classrooms and school across the province each fall. In 2015, Dots NB was brought into the Partners For Youth Inc. umbrella. Since then, the program has continued to grow in scope and impact. The Ring-a-Bell campaign has expanded to more schools and has been enhanced to include a greater participation from both provincial and national elected officials. 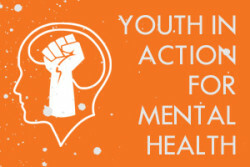 At the same time, a new project entitled Youth in Action for Mental Health was created to provide related education and leadership skills for students in high schools across the province. As with all our initiatives, we continue to push for innovative projects to support youth through the province and beyond. While the subject of mental health is strewn through all of our programs, below is a list of projects developed and coordinated specifically by our Dots NB Project Coordinator. In 2012, the Government of New Brunswick made an official declaration that December 7th would hence be known as Dots for Kids Day. The declaration of such a day was meant as a way of promoting greater discussion and awareness on the mental health needs of children and youth. To mark this occasion, the Ring-a-Bell campaign brings together students, educators, and elected officials for a week-long series of activities and discussions on topics related to mental health. Resources are provided to school staff, including lesson plans and other ideas for activities to promote an understanding of topics related mental health and break down the silence and stigma surrounding these important personal and social issues.